Joseph Neeld (1789–1856), Grittleton Manor, Chippenham, Wiltshire; By descent to his brother Sir John Neeld, 1st. Bt. (1805-1891); Thence by descent to Sir Audley Dallas Neeld, 3rd Bt. (1849-1941); Until sold by order of his Executors, Christie's, London, 13 July 1945, lot unspecified, for 2,800 guineas (as Velásquez according to an old newpaper clipping); English private collection; Thence by descent to the present owner. G.F. Waagen. Treasures of Art in Great Britain, London 1854, vol. II, 245. London, Royal Academy of Arts, 1878, no. 130 (as Velásquez). Although the early history of this portrait is unknown, at some point in the early-to-mid nineteenth century it was acquired by the politician and art collector Joseph Neeld, and hung at his country residence Grittleton Manor in Wiltshire. It was here, in the 1850s, that the German art historian Gustav Friedrich Waagen saw the portrait and first mentioned its ‘bearing the name of Velazquez’. How it entered the collection of Neeld remains a mystery, however we know that it was later exhibited at the Royal Academy in 1878 where it was described again as being by Velazquez. The portrait then passed down through the family until, on the death of Sir Audley Dallas Neeld in 1941, it was sent to auction where it was sold, as by Velazquez, for 2,800 guineas to a private collector. That the artist behind this work was familiar with Velazquez is evident at first glance. The placement of the sitter in front of a plain, neutral backdrop is distinctly reminiscent of his work and the painterly style, which is broad and confident in areas – see for example the highlighting around the facial features, is highly evocative of his hand. Although the identity of the sitter in the present work is at currently unknown, his rich attire suggests he was a man of importance, and the letter he holds in his right hand may suggest he held an administrative position. Born in Seville, Spain in 1599, Velázquez was initially educated to undertake a learned profession, training in languages and philosophy. However, after displaying an early interest in painting he commenced his artistic career at the age of eleven, studying under the local artist Francisco de Herrera. Velázquez remained with de Herrera for a year and then continued his training with Francisco Pacheco for a further five years and whose daughter, Juana Pacheco, Velázquez married in 1618. 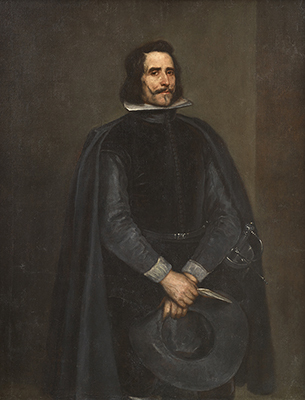 From Seville, Velázquez travelled to Madrid in 1622 with a letter of introduction to Don Juan de Fonseca, Chaplain to the king of Spain, but initially from the artist’s home town. Conveniently, at the end of 1622, King Philip IV’s favourite court painter, Rodrigo de Villandrando, died and Velázquez was introduced to the king, whom he painted for the first time the following year. The king was so impressed with Velázquez’s portrait that he paid for the artist and his family to move permanently to the capital. Velázquez became the leading painter at the court of Philip IV and, amidst the Spanish Golden Age, was painting at the same time that Cervantes was writing ‘Don Quixote’. Amongst his sitters was the Prince of Wales, later Charles I, who visited Philip IV’s court in 1623. Four years later Velázquez had the opportunity to work alongside Peter Paul Rubens, who was at the height of his career in 1628, and spent six months at the Spanish court on a diplomatic mission. It was Rubens who encouraged Velázquez to visit Italy to train further and, although little is known about his year and a half trip in 1629, Philip IV sponsored it. Velázquez visited Italy a second time twenty years later to buy works by Titian, Tintoretto and Veronese on behalf of Philip IV and the Spanish royal collection. This visit proved complicated for the artist as he had an affair which resulted in a child; this delayed his return to Madrid for some months. In 1658 Velázquez was made a knight of Santigo and in 1660, after travelling to the French Spanish border for the marriage of Maria Theresa and Louis XIV, Velázquez returned to Madrid and died of a fever on the 6th August. His wife died just a few days later. Today, many of Velázquez’s Spanish contemporaries have been overshadowed by his unprecedented career, such as Antonio de Pereda and the Rizi brothers, Juan Andrés and Francisco. Edouard Manet letter to Henri Fantin-Latour, 1865.